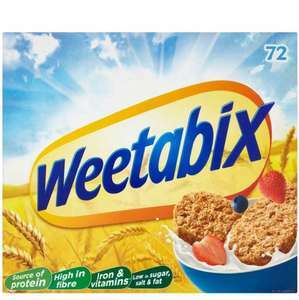 Local farm foods has 72 pack of weetabix on offer. 3 packs for £10. Works out at £3.33 per pack. Been this price for weeks. Thats cheaper than Wheat Bisks! Someone tell Dave Gorman! Farmfood is great for cornflakes/cereals as their prices are usually low. Been the price for months more like lol. Saw this back in September.....has time gone that fast? Still good price but as you say it has been like this ages, alos posted before. Even if you ate them all in one sitting, you'd still get more nutrition eating the box. Im sure they miss your £1.70. You can spend double at a big retailer …Im sure they miss your £1.70. You can spend double at a big retailer instead. Why are you doing a jibe here unnecessarily , its counter productive you know. Why would I spend double?? Farmfood prices are at par or higher than the supermarkets in terms of fish fingers which is why I dont shop there anymore. Why are you doing a jibe here unnecessarily , its counter productive you …Why are you doing a jibe here unnecessarily , its counter productive you know. Why would I spend double?? Farmfood prices are at par or higher than the supermarkets in terms of fish fingers which is why I dont shop there anymore. As I said, you will be sorely missed by Farmfoods. Nobody cares if you stopped going because they increased their prices. Like price increases are limited to Farm foods. Nobody cares if you stopped going because they increased their prices. …Nobody cares if you stopped going because they increased their prices. Like price increases are limited to Farm foods. I care that you're talking nonsense. I dont care for what you say. You wanted a response so i gave you one. I care that you're talking nonsense. I dont care for what you say. You …I care that you're talking nonsense. I dont care for what you say. You wanted a response so i gave you one. This coming from a guy who talks nonsense himself.